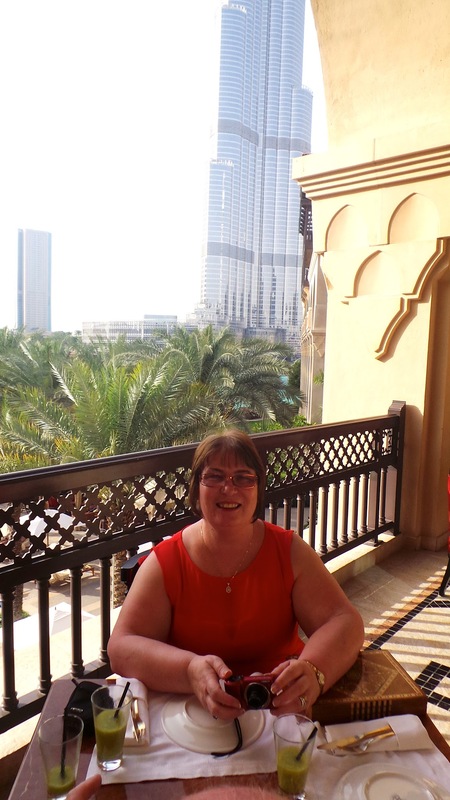 I normally blog about beauty but it's my mums birthday today and we did something so lovely I wanted to share it on my blog and recommend it to Dubai residents and visitors alike! Last year I took my mum to New York for her 60th birthday-it was a surprise which I blogged about here. We had such an amazing time and this year it was always going to be impossible to top that! 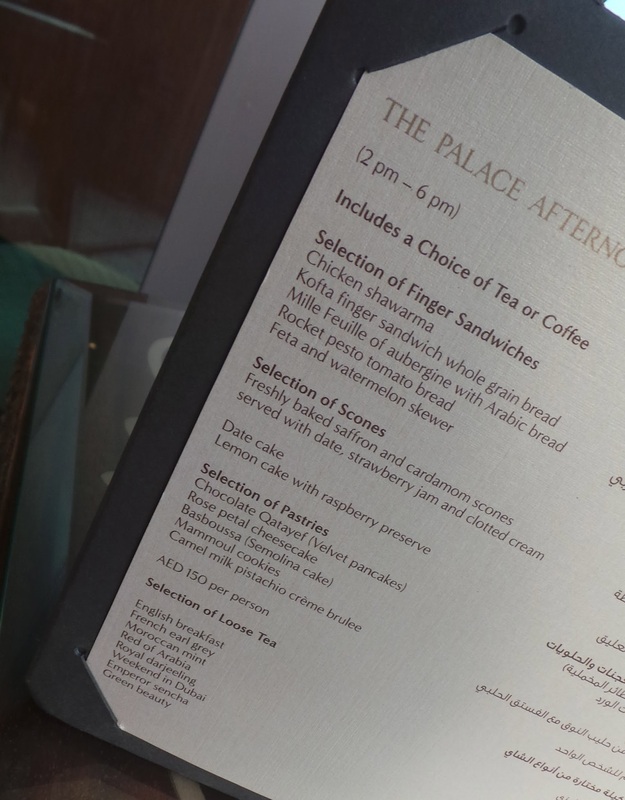 I sent mum to the spa this morning for a relaxing massage and facial and then had a car pick her and my dad up at 4pm to go to an undisclosed location which was the Palace Hotel in Downtown Dubai. 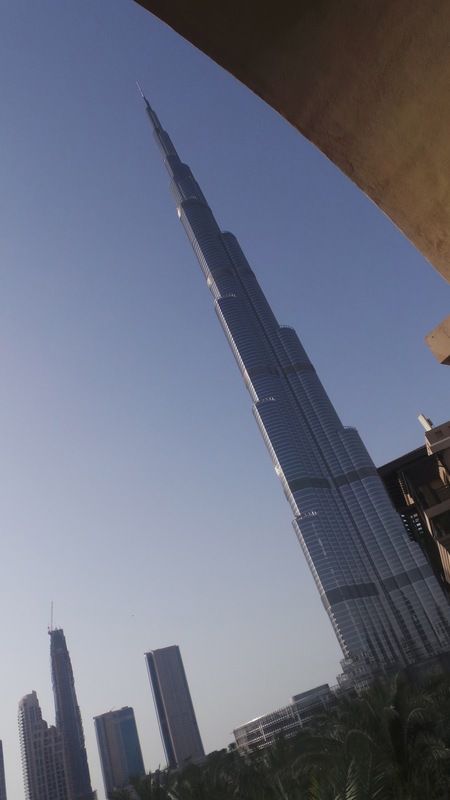 The hotel is so luxe and is located in the prestigious Downtown Dubai development. It's close to my office but to be honest I have never really been before apart from to the shisha lounge by the pool. I did quite a bit of research before choosing here for my mums birthday and I was really thrilled with my choice! 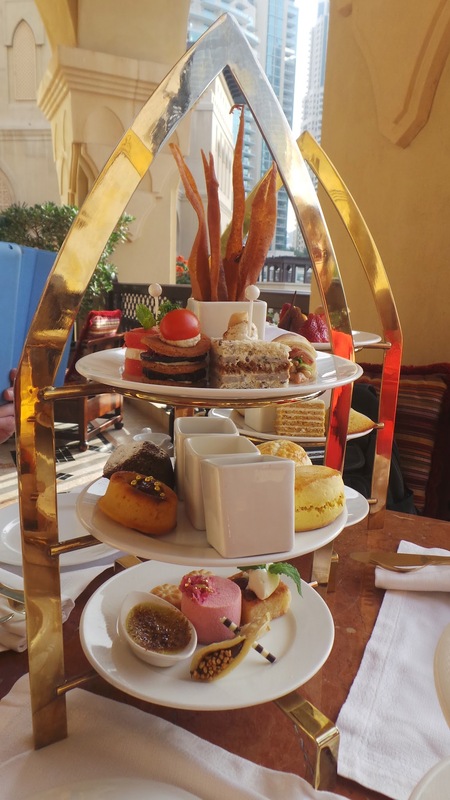 My mum and dad have done a lot of afternoon teas in Dubai over the past 9 years I have lived here and this one was definitely one of the best-if not the best. The hotel is inviting, serene and calm with a huge water feature full of roses in the lobby. 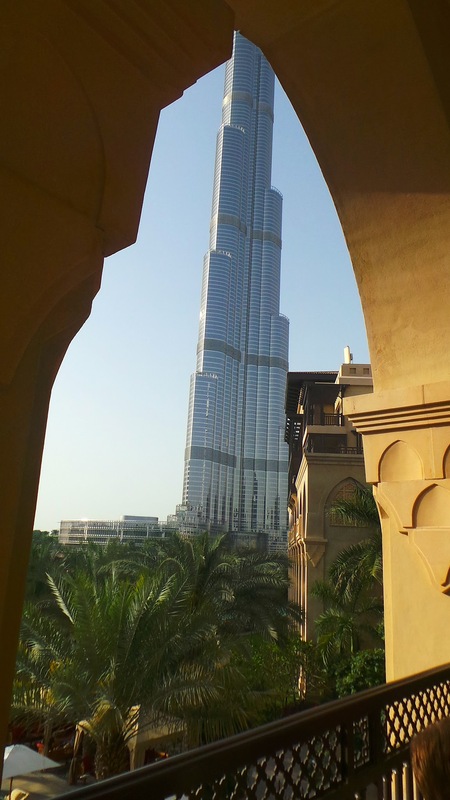 Al Bayt is the lobby lounge where afternoon tea is served and we had a table on the terrace overlooking the iconic Burj Khalifa and the hotel pool. Inside, there is a violinist playing live as well. 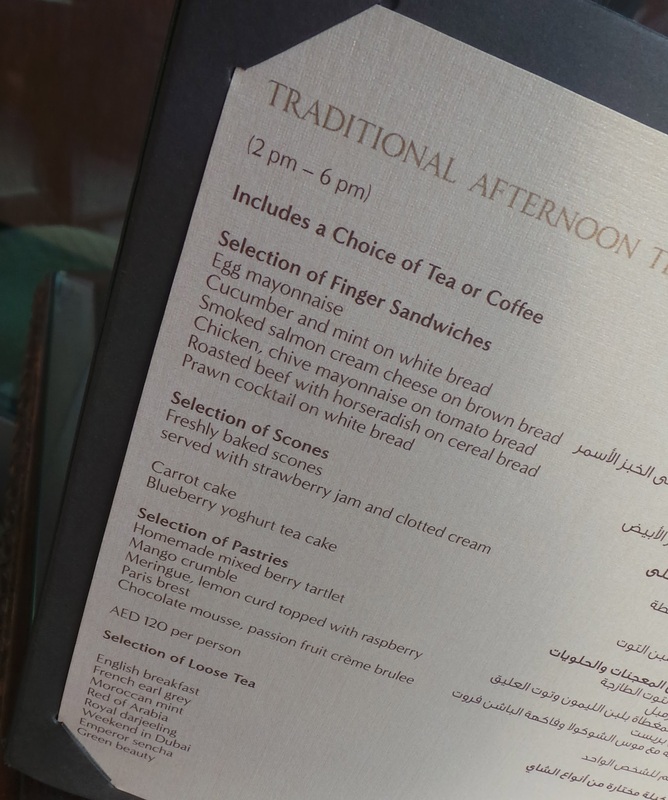 The hotel offers two options for afternoon tea-a traditional English afternoon tea or a version with an Arabic twist. I went for the Arabic version and mum and dad both had the traditional English. I loved the three tiered stands the afternoon teas were served on. Reminiscent of very Arab style doors and windows. The sandwiches on the traditional tea were so delicate and so English-egg mayonnaise, smoked salmon, roast beef etc, all beautifully presented. The selection of pastries were to die for, again beautifully presented. There was also 2 scones with fresh cream and homemade jam. The sandwiches on the Arabic version were uh-mazing! I loved the aubergine in Arabic Bread, Kofta Finger sandwich and houmous with breadsticks. The saffron scone was delicious, especially with date jam. Scones are always my favourite part of afternoon tea and I was so happy these were amazing! They also gave my mum a complimentary cake with a big sparkler in it-she jumped when it was lit as she wasn't expecting it to go up as it did! The whole experience was lovely-the setting was perfect, the atmosphere was welcoming, relaxing and luxurious, the service was very good and the food was delicious. I did have to giggle though when we got there and there was no booking in my name. The hotel was unfazed and it later transpired the booking had been in fact made in the name of 'Facey'. That's a new one on me-the local lebanese calls me 'Spacy' (lol) and the pizza place has me down as 'Daisy' but 'Facey' is a new moniker. 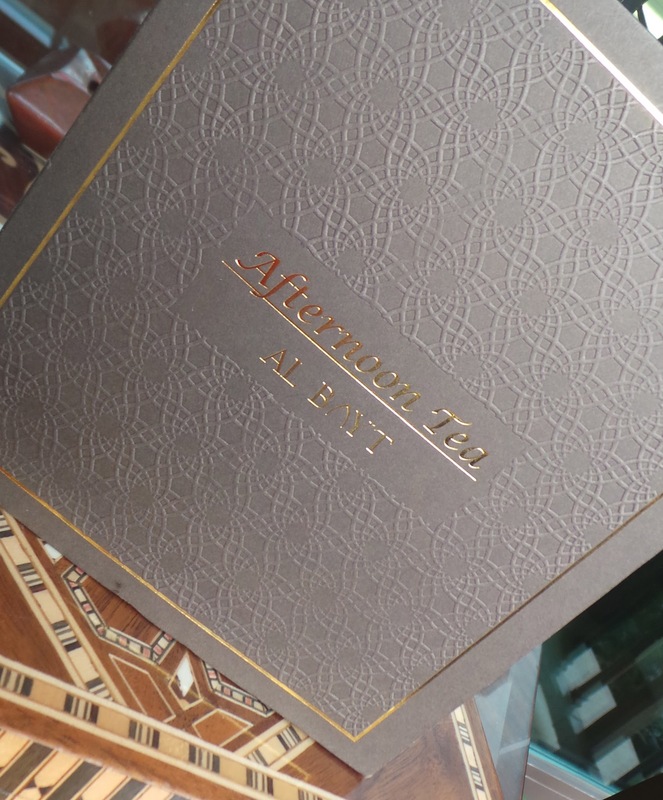 The afternoon tea is AED130 (just over £20) for the traditional and AED150 for the Arabic version. If you live in Dubai and have the Entertainer there are 3 vouchers for afternoon tea in there-buy one get one free-I didn't actually know that but the hotel kindly told me and I redeemed one of the vouchers so we only paid for two teas. For what you get and the location and service I think that is amazing value and I will definitely be going again. I'm still full up now! Finally here is the necklace I bought my mum for her birthday-I think it's really pretty and my jeweller did a great job. Mum and dad leave in the morning, I have loved them being here with us over the past 10 days. I think I might do a post about my birthday as it was a fantastic day and I received some fantastic beauty gifts!! I am a bit behind reading my favourite blogs but will hopefully catch up this weekend between studying and packing for my trip to Cairo on Sunday!